A 47-year-old man and a 54-year-old woman were released without charges Sunday after having been taken into custody in relation to the drone sightings that shut down the U.K.'s second-largest airport for a 26-hour period over Wednesday and Thursday and for a third time on Friday. Sussex police said the pair was cooperative and they were "satisfied that they are no longer suspects in the drone incidents at Gatwick." "It is important to remember that when people are arrested in an effort to make further enquiries it does not mean that they are guilty of an offence and Sussex Police would not seek to make their identity public," police said in a statement. Air traffic at Gatwick Airport was snarled on some of the busiest travel days of the year due to what police called intentional acts done to disrupt airport operations. The pair was initially arrested late on Friday. "As part of our ongoing investigations into the criminal use of drones which has severely disrupted flights in and out of Gatwick Airport, Sussex Police made two arrests just after 10pm on 21 December," Superintendent James Collis said in a statement. "Our investigations are still on-going, and our activities at the airport continue to build resilience to detect and mitigate further incursions from drones, by deploying a range of tactics." Sussex police said both of the people arrested were from Crawley, a town about 5 miles away from Gatwick Airport. Police did not name the suspects or provide any further details on how the arrests came about. 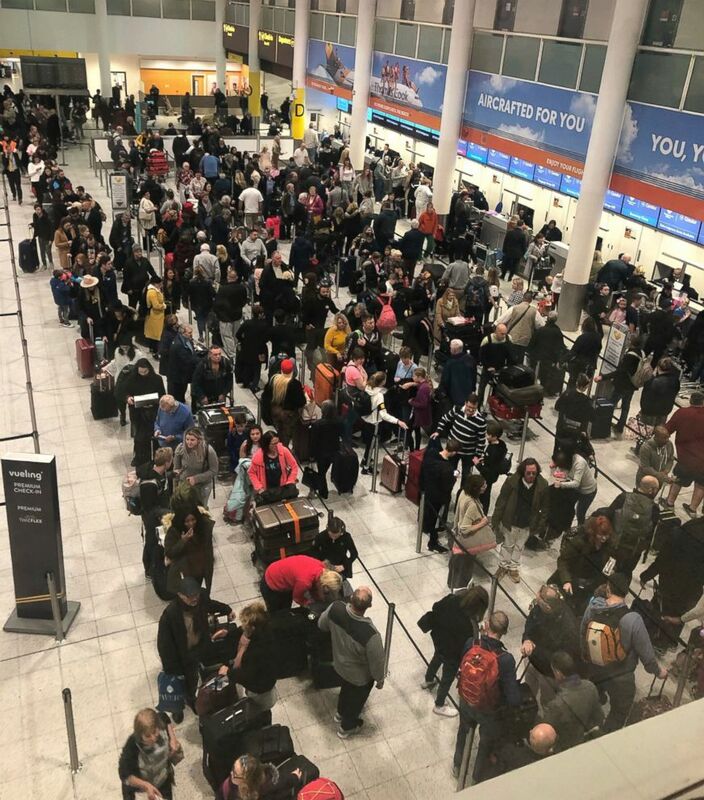 Gatwick Airport reopened on Friday morning, just to temporarily suspend the airfield in the early evening, a spokeswoman confirms to ABC News. A drone was reported to have been seen at 5:10 p.m. 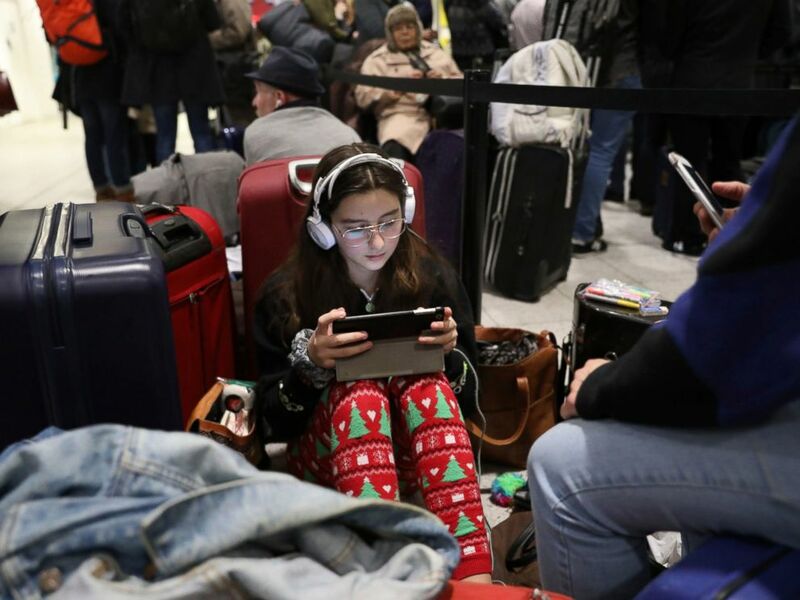 The airport had already been closed for 26 hours straight this week, one of the year’s busiest days for air travel, with cancellations that affected more than 110,000 passengers. It first shut down at 9:03 p.m. on Wednesday due to reports of two drones flying over the airfield. Despite reopening in the early morning hours, the airport was closed for most of Thursday. Airport officials announced early Friday that the runway was open again and "a limited number of aircraft are scheduled for departure and arrival." Sussex police told ABC News they had yet to find the drone operator who was causing the shutdown. The last drone sighting before Friday's suspected one was just before 10 p.m. Thursday. "Gatwick's runway will remain closed and all flights are cancelled for the rest of the evening because of continued drone sightings in and around the airfield," Gatwick Airport said in a statement Thursday night. A regional police chief told the BBC there were a “number of lines of inquiry” being pursued by police, including the possibility the drone operators were environmental activists. Sussex Police assistant chief constable added that there were measures available to tackle the drone threat that ranged from “technical, sophisticated” options to less sophisticated options, such as shotguns. The Ministry of Defense also announced Thursday that it was assisting police at the airport. 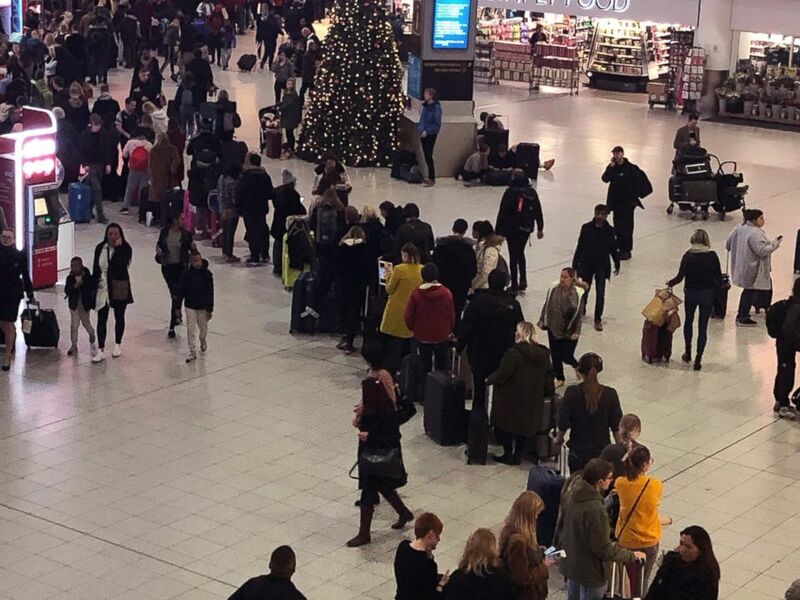 Queues of passengers wait at the check-in desks at Gatwick Airport, as the airport remains closed with flights delayed or diverted to other airports, after drones were spotted over the airfield last night and this morning Thursday Dec. 20, 2018. Unauthorized use of drones in the U.K. can result in fines and jail time. There have been calls for tougher sanctions after the chaos at Gatwick. "We've already passed legislation in relation to the use of drones so it is now, as has been made clear, that the activity that we've seen is illegal and those who are caught endangering aircraft can face up to five years in prison," U.K. Prime Minister Theresa May told The Associated Press. "That's legislation we've already introduced and actually we're consulting on further aspects of this, including for police powers, but we will continue to work with the Gatwick authorities and police will be working with the Gatwick authorities in order to bring this to a close." 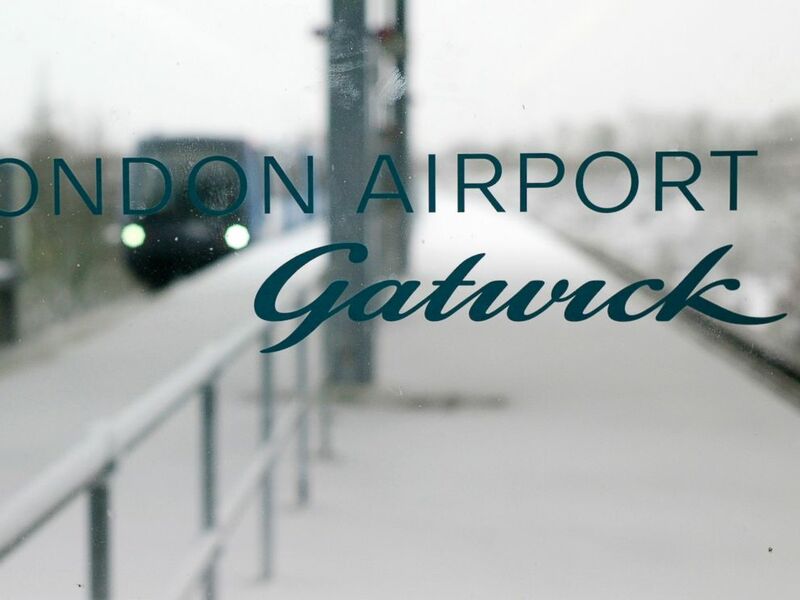 Gatwick officials said "a number" of flights were diverted to other airports and airlines were "working to provide affected passengers with hotel accommodation or transport passengers landing at other airports to Gatwick by other means." Airport officials said around 760 flights were canceled on Thursday. Many planes were diverted to other U.K. airports including Manchester and Glasgow, as well as nearby European airports such as Paris or Amsterdam. "We apologize to any affected passengers for this inconvenience but the safety of our passengers and all staff is our number one priority," the airport said in a statement. A joint search was being carried out by Sussex Police and the airport for the drone operators, authorities said. "I've got officers not only in the terminals and on the airfields looking for the drone and the drone operator, but I've got resources from Surrey and Sussex right the way across the outside of Gatwick trying to identify who's operating this drone," Sussex Police Superintendent Justin Burtenshaw said. "It's been going on for 10 hours now and I'm absolutely certain this is a deliberate act to disrupt the airfield." ABC News' Dada Jovanovic, James Longman and Alexandra Svokos contributed to this report.